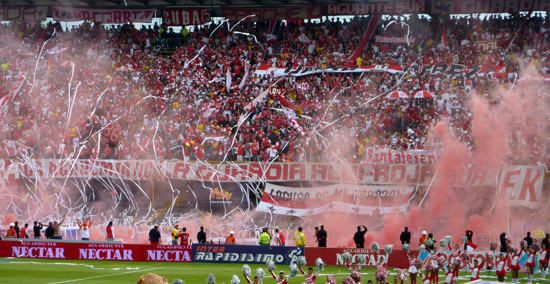 The two traditionally big football clubs in Bogota are Club Deportivo Los Millonarios and Independiente Santa Fe. Millonarios, have a glorious history and were once considered one of the best teams in the world. Back in the 1950s, Colombian clubs were outside FIFA and so not restricted to its salary restrictions. The lure of high salaries attracted the world's best players including the great Alfredo di Stefano. Millonarios played several games in Europe including some famous victories against Real Madrid in the Santiago Bernabeu. As a result, they soon became known as 'Los Embajadores' (The Ambassadors(of Colombian football)). 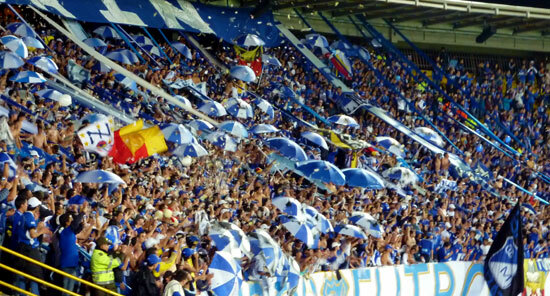 These past glories mean that Millonarios have a bigger support in Bogota than Santa Fe, although Santa Fe also has a large fan base. Despite being 'big guns' in the Colombian football league both struggled through decades-long lean patches without winning a championship. Millonarios had won their last championship (their 13th) in 1988, and Santa Fe had not lifted the trophy since 1975. Both Santa Fe and Millonarios finally ended the championship-less spells in 2012, by winning the Apertura and Clausura tournaments respectively. 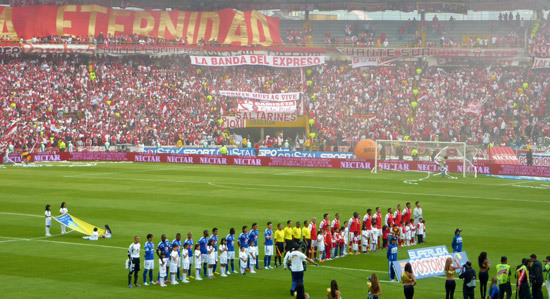 Both teams play their home matches at the Nemesio Camacho El Campin Stadium (Transmilenio station "El Campin" on carrera 30) which has a capacity of around 45,000. If you get the chance, I'd definitely recommend going to a 'clasico' (derby match) between the two sides. While you have to have your wits about you in and around the stadium, you shouldn't have any problems. It's best to sit in the Occidental or Oriental stand with the home fans and wear a neutral colour. In 2007 La Equidad Seguros gained promotion from Division B and have enjoyed reasonable succss in the top flight reaching several finals. In addition to soccer another popular Bogota sport is Tejo. 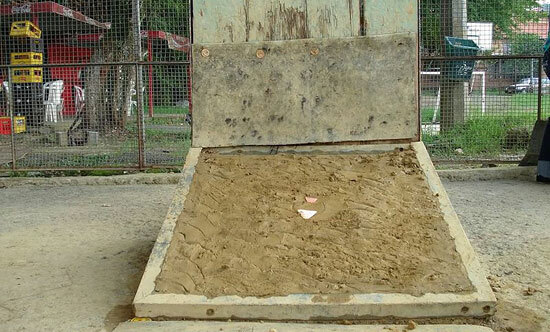 Tejo involves throwing a metal disc into a sand pit mounted on a stand with the objective being to land it on a small explosive called 'mecha'. Bullfighting is one of the more traditional Bogota sports. Bullfights take place at the Plaza de Toros de Santamaria next to the Parque de la Independencia and near the Colpatria skyscraper. Bullfighting season is January and February. Every Sunday many of Bogota’s main streets are closed off and made available to cyclists. The routes, known as ‘ciclovias’, are very popular with people cycling, jogging, roller skating or simply walking with the family. The routes are well policed and you’re never too far from someone selling refreshments along the side of the streets. Interested in what else the Colombian capital has to offer? Return to the Bogota city guide.